Have you worked from a home office before? You will align your career with a company on the uptick: backed by 125 years of success in employee recognition and 26 years in recruiting, we are reinventing ourselves, our solutions and our technology. You will focus on selling recruitment solutions and also tee up employee reward and engagement sales -we offer the industry's first résumé-to-retirement employee engagement solution. If you're new to the HR/talent management space, you'll find it is a very positive, rewards-based industry focused on the upside of business. Engage2Excel is backed by Comvest Partners, a leading equity firm committed to investing in E2E's strategic vision and growth. You will enjoy E2E's unique culture, which includes an upbeat and collegial environment, kudos, collaboration, fun, and a passion for excellence. We have multiple opportunities for Business Development Executives at different levels of experience, so feel free to share this information with your networks. Engage2Excel is an industry pioneer in the recruitment solutions space, and we are dedicated to providing excellent service with the utmost integrity while growing our business. We have the expertise, science-based methodology and industry-leading technology that companies need to succeed. Our innovative recruitment solutions, employee recognition programs, and engagement surveys help HR leaders drive bottom-line benefits for their organizations. We are always looking for outstanding candidates to join the Engage2Excel team. We thrive on providing a rewarding, fulfilling, and fun workplace for our employees, so it's no surprise that many of our employees have been with us for most of their careers. You'll join as our re-engineered go-to-market strategies drive strong growth. Companies of all sizes face unrelenting competition for top talent, ongoing changes in the workplace and increasing demand for new skill sets. Engage2Excel is uniquely positioned to provide our clients with an important competitive edge: the ability to attract, engage and retain great people. No other single firm leverages research-based insights to provide end-to-end employment solutions. Moreover, our solutions are proven to deliver a strong return on investment, including attracting top talent, promoting retention, increasing productivity, and more. You'll be able to leverage success stories from clients in a wide variety of industries, such as Coca-Cola, Delta Airlines, Fluor, Honeywell, St. Jude Research Hospital, Transamerica, and many others. Rewarding those who earn it. Imagine a job that lets you help others identify solutions to find employees and keep them. E2E is as much a calling as it is a company, because we ignite the inner accomplishment that drives pride, inspires others and makes work fun. In addition to a competitive base and commission, we offer comprehensive benefits, including medical, dental, and vision insurance; a 401(k) plan; paid time off; and more. High sales courage and willingness to take calculated risks. Business acumen and a solutions orientation to selling -- you should take personal and professional satisfaction in helping customers solve problems. A "servant" attitude to sales that includes teaching, developing trust-based relationships and managing details for customers. A team approach to complex sales and the ability to coordinate among multiple internal resources. Computer literacy and proficiency in Microsoft Office applications. Solid interpersonal and communication abilities, including listening skills and presentation polish. Experience selling software is strongly preferred, and experience selling to HR professionals would be ideal. If you're the person we're looking for, you know most of what this role entails. However, to be sure we're providing a well-rounded picture, here are some details. You'll focus on developing new clients, and also help retain and expand business with new on-demand clients, new RPO clients and existing clients. We'll provide you with leads and also look to you to generate your own. Either way, you'll qualify them and see each one through to signing. In general, you'll interact with human resources decision-makers, and you may already know that they appreciate solutions tailored to their organizations' unique needs. You'll take point on developing those tailored solutions, working closely and seamlessly with internal departments for proposal/presentation support, strategy/subject matter expert support and operations support on sold deals. Developing and executing strategies and tactics targeted for each prospect, including creating proposals and RFPs. Working closely and cordially with internal support teams during implementation and management of clients. Following up regularly with existing accounts to ensure satisfaction and explore new opportunities. Documenting customer intelligence and business development activities. Providing internal teams with market and competitive insights. Developing and maintaining strong knowledge of the talent management space, including recognition and incentives. Pictured: Engage2Excel's RESPECT engagement survey platform was developed by Jack Wiley, Ph.D. Based on 30 years of research and surveys of millions of employees for leading global brands, the RESPECT survey system helps customers understand survey results and put in place action plans to drive future success. Dr. Wiley is an award-winning organizational psychologist recognized internationally for groundbreaking research that links employee survey results to measures of business performance. Did you know that employees overwhelmingly favor length of service rewards? Or, that employee engagement begins even before someone is hired? Most people don't. To excel in this role you'll need those active listening skills, but you'll also need to pepper in some teaching. You'll need the right balance of patience and persistence in managing longer, consultative sales cycles. Pivotal to your success will be your ability to take trust-based relationships one level higher and convince your prospects and clients that your own success is tied directly to theirs. You'll need to quickly develop subject matter expertise in the HR/talent management space (if you don't already have it) and also take a proactive approach to understanding each prospect's unique goals and challenges. The solutions can be complex, and they are backed by extensive research that fills two full books and more. You'll need a knack for distilling that complexity into a simple, powerful, and easy to understand story. Internally, you'll need to be able to develop relationships with people in different departments and functional areas, including marketing, finance, technology and manufacturing. You'll depend on their contributions to achieve your goals, and you should recognize that they all have their own priorities and agendas. Your influencing and motivating skills will prove invaluable as you "quarterback" the team to win after win. At Engage2Excel, we help HR organizations create unique candidate and employee experiences from pre-hire to retirement. Research shows that engaging workplace experiences are essential for motivating employees to care more, work smarter and stay longer. 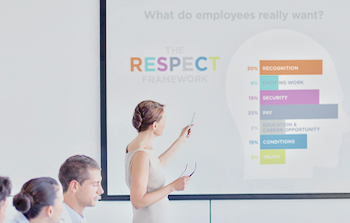 We understand what employees really want because we look at the entire employee lifecycle through a scientific lens. Our Trendicators research division conducts original surveys, validates best practices from our client base of 2,700+ organizations and relies on three decades of groundbreaking research by our chief scientific officer, Jack Wiley, Ph.D. Our industry-leading solutions for recruitment, employee recognition and engagement surveys are tailored to each client's unique business objectives and are designed to help clients increase competitive advantage and improve bottom-line results. Recruitment Solutions: Attract, engage and hire employees who care more, work smarter and stay longer. Employee Recognition: Design, scale and improve employee recognition programs to accelerate your success. Engagement Surveys: Analyze, benchmark and improve engagement to increase your competitive advantage. If you are a qualified individual with a disability or a disabled veteran, you have the right to request an accommodation if you are unable or limited in your ability to use or access our career center as a result of your disability.